One of the pieces in the new Harriet Tubman Underground Railroad Visitor Center in Church Creek, Maryland: a list of the 70 slaves she brought to freedom. News4's Barbara Harrison visited the center to see how it's making Tubman's legacy real to a new generation. By the time she decided to run, Harriet Tubman knew the forests and marshes of Maryland's Eastern Shore like the back of her hand. She ran through the night, gravitating toward the peninsula's cold, still water. She could move quietly through it. Her father taught her how. But after completing the perilous journey to freedom, Tubman realized she was alone. "I had crossed the line. I was free, but there was no one to welcome me to the land of freedom. I was a stranger in a strange land," Tubman would later say. Desperate to be reunited with her family, Tubman quickly got a job and saved money so she could rescue her friends and family personally. She returned to the Eastern Shore 13 times, bringing 70 slaves to freedom. On Saturday, you can see a list of those names at the new Harriet Tubman Underground Railroad Visitor Center in Church Creek, Maryland. The visitor center is just one of 36 stops on the Harriet Tubman Underground Railroad Byway, a 125-mile, self-guided driving tour through Tubman's native land. As you wander through the 10,000-square-foot visitor center, bronze-colored statues depicting scenes from Tubman's life are positioned throughout the exhibition space. All are inspiring, but a piece recreating the Combahee River raid may stop you in your tracks. This statue depicts the Combahee River Raid. On the night of June 2, 1863, Tubman became the first and only woman to lead an armed assault during the Civil War. Working as a wartime spy, she helped guide three steamboats around Confederate mines. Once the boats reached the shore, they sounded their whistles and attacked. "It was guerrilla warfare, basically," said assistant park manager Angela Crenshaw. "They were flooding rice fields, they were blowing up plantations and they were emancipating people." Hundreds of slaves ran for the shore when they heard the steamboats' whistles. Tubman later said she had never seen "such a sight." Tubman and the Union troops rescued 720 to 800 people that day, Crenshaw said. 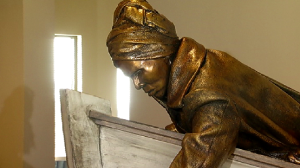 The statue in the visitor center depicts that rescue, with Tubman leaning over the bow of a small boat to pull fleeing slaves out of the water. The scene is one you don't often hear about in the retelling of Tubman's life. Despite her heroic efforts, Tubman didn't receive any payment for her service for years. Before she was known as the Moses of her people, Tubman was Araminta "Minty" Ross. As a child, Tubman was often loaned out to other slave owners and suffered unimaginable cruelties at their hands. At the Bucktown Village Store, she committed her first act of defiance and suffered a blow that nearly killed her. While working for a nearby farmer, Tubman went to the store with the farm's cook to purchase some items. At the same time, a young slave who left his home without permission entered the store with an overseer in hot pursuit. The overseer ordered Tubman to hold the slave, but she refused. Angered, the overseer threw a 2-pound counterweight at the slave, but he missed and struck Tubman. The weight fractured her skull. The counterweight (left) is similar to the one Tubman was struck with. “They carried me to the house all bleeding an’ fainting. I had no bed, no place to lie down on at all, and they lay me on the seat of the loom, and I stayed there all that day and next,” Tubman later recalled, according to the byway's website. The injury plagued her for the rest of her life, causing symptoms similar to epilepsy. But that same injury gave her the "potent dreams and visions she claimed foretold the future," author Kate Larsen said in Tubman's biography "Bound for the Promised Land." "The sleeping disease is actually what made her very successful in her life, because she said when she would fall asleep God would speak to her," said Susan Meredith, who owns and operates the Bucktown Village Store with her husband, Jay. The Bucktown Village store is one of the stops on the Harriet Tubman Underground Railroad Byway. The store was once owned by Jay Meredith's great-great-grandfather, but Susan and Jay Meredith purchased it years later, renovating it and opening it as a museum. "When we bought it, we made Maryland Life magazine as one of the top 10 places in Maryland in danger of falling down," Susan Meredith said, laughing. Once the visitor center opens, the Merediths plan to open the store to guests Monday through Saturday from 10 a.m. until 4 p.m.
After stopping by the Harriet Tubman Underground Railroad Visitor Center, guests are encouraged to immerse themselves in Tubman's story by driving along the byway and visiting sites like the Bucktown Village Store. "We tell the story, and then people go out and explore," Crenshaw said. This weekend, re-enactor Millicent Sparks will embody Tubman while historian Tony Cohen leads a simulated Underground Railroad journey. Park rangers will also teach the games enslaved children plays.